Presented with a puzzle that consists of only six pieces, most wine drinkers might suspect that they have been given some sort of sobriety test. However, these colorful little markers are meant solely to keep your wine glass in check. 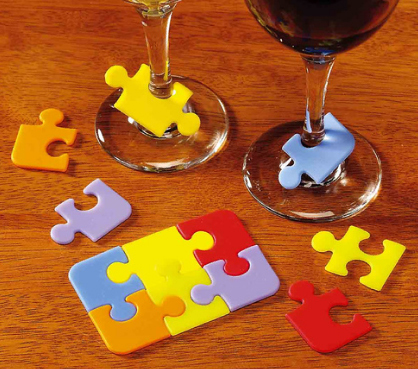 Whether or not you wish to put together these Puzzle Wine Glass Markers is entirely up to you, but they are probably more useful in solving the question of whose wine glass it is that you’re about to drink—especially for the girls if they all have a similar shade of lipstick on that night. One App, Four Thousand Skillets. Free.